Ramaswamy, R., et al. Management of Pneumatosis Cystoides Intestinalis in Scleroderma: A Case for Cautious and Coordinated Care. (2016) J Palliat Care Pediatr 1(1): 1- 2. © 2016 Ramaswamy, R. This is an Open access article distributed under the terms of Creative Commons Attribution 4.0 International License. Scleroderma or Systemic sclerosis (SSc) is an auto-immune condition characterized by widespread vascular dysfunction and progressive fibrosis of the skin and internal organs, with a prevalence of 150 – 300 cases per million and a female preponderance. Upper gastrointestinal (GI) manifestations of SSc include oesophageal dysmotility, decreased lower oesophageal sphincter function, bleeding erosive esophagitis, gastroparesis and Barrett’s oesophagus. Lower GI features include dysmotility with functional “blind loops”, bacterial overgrowth, malabsorption and pseudo-obstruction. These can lead to GI haemorrhage and Pneumatosis Cystoides Intestinalis (PCI)[2,3]. We describe two SSc patients with PCI who underwent potentially unnecessary abdominal surgery. A 70 year-old female nursing home resident was admitted for lower extremity dry gangrene and wound dehiscence. Her medical history included SSc, peripheral vascular disease, hypertension and chronic kidney disease. Upon admission, a rheumatology consult recommended starting IV iloprost and heparin and the vascular team recommended IV antibiotics, ABI/PVR, a duplex of the RLE, and a CT angiogram to evaluate for further vascular intervention. The CT angiogram incidentally revealed multiple dilated loops of small bowel with fecalization compatible with small bowel obstruction. Several loops in the left mid-abdomen demonstrated foci of gas along the dependent portion of the walls, but did not appear to be in the bowel wall itself, consistent with PCI. An emergent surgery consult was called to evaluate for SBO and ischemic bowel. On examination, the patient was lethargic but did not have abdominal tenderness. Given her CT scan findings and a concern for sepsis, an urgent diagnostic laparoscopy was conducted. The left colon and sigmoid colon seemed slightly edematous and full of stool, but not ischemic. Post-operatively, the patient was mechanically ventilated in the SICU. Her course was complicated by delirium, self-extubation, aspiration pneumonia and re-intubation. A palliative care consult was called to discuss goals of care. A palliative extubation was done and the patient expired. 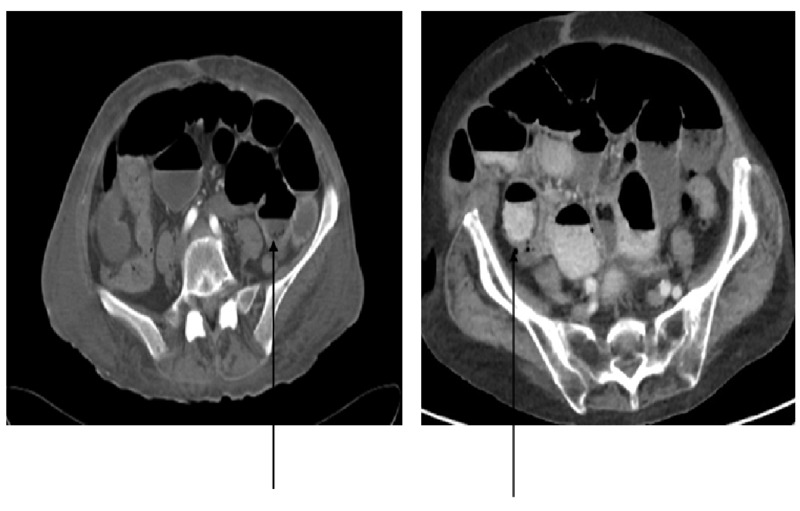 An 81 year-old community dwelling female with a medical history of hypertension, hypothyroidism, SSc and osteoporosis was referred by her gastroenterologist for a CT scan of the abdomen to evaluate unintentional weight loss of 30 lbs and frequent bowel movements. The radiologist reported high-grade small bowel obstruction and multiple prominently dilated bowel loops, and evidence of PCI in multiple right-sided loops of opacified bowel and pneumoperitoneum. These findings were communicated instantly to the referring gastroenterologist, who recommended transfer to the Emergency Department (ED) and an emergent surgery consultation. In the ED, the patient denied all gastrointestinal symptoms. Vital signs were stable, and physical examination revealed a soft, non-tender, and mildly distended abdomen. Despite a negative history and physical exam, the patient was taken emergently for an exploratory laparotomy to rule out ischemic bowel and peritonitis. In contrast to the CT findings, there was no clinical evidence of ischemia, infection or perforation. The patient recovered well post-operatively and was discharged home. Figure 1: CT Scan of the Abdomen in case 1 (left) and 2 (right), both demonstrating foci of gas (arrows) in the walls of several intestinal loops, suggestive of Pneumatosis Cystoides Intestinalis (PCI). Was there a lack of awareness among treating physicians about SSc? Was emergent surgery indicated? Is there a role for interdisciplinary medical decision-making in an emergency setting? PCI is characterized by air in the bowel wall, with or without free gas accumulation in the peritoneal cavity. It usually appears later in the SSc disease course and has a subacute, progressive and remittent course. Patients may have concomitant pseudo- obstruction and/or bacterial overgrowth. It can persist for years without clinical evidence of peritonitis. The management of PCI is mainly supportive, with fluid and electrolyte supplementation, bowel rest and decompression[4,5]. Octreotide and IVIG are used rarely. Surgical intervention is not indicated, especially when clinical signs of bowel ischemia are absent, because there is no true perforation of the intestinal wall. Surgery neither resolves PCI secondary to SSc nor does it prevent its recurrence. Several lessons emerge from these two cases. SSc in older adults is rare, but may be more severe and progressive when present. In general, a high index of suspicion is essential when evaluating geriatric patients, who often have subtler and atypical presentations. However, the need for a timely diagnosis and appropriate patient-centered management of PCI in SSc highlights the importance of medical knowledge and interdisciplinary care. Improving knowledge of the natural history, pathophysiology and prognostic factors of SSc among the various specialties involved may help with treatment decisions. The advancement of CT imaging has the potential to greatly assist, but not replace, bedside evaluation and clinical judgment. Finally, coordinated care, involving the radiologist, rheumatologist, geriatrician, gastroenterologist, and surgeon, may result in reduction in unnecessary surgery, morbidity and mortality. Author Contributions: All the authors were involved in the article’s concept and design, acquisition and analysis of data and writing and final approval of manuscript. Conflict of Interest: None of the authors have any conflict of interest. 1. Mayes, M.D. Scleroderma epidemiology. (2003) Rheum Dis Clin North Am 29(2): 239-254. 3. Clavadetscher, P., Binkert, D., Wellauer, J. Complications of cutaneous scleroderma. (1975) JAMA 232(4): 390-391. 4. Hoover, E.L., Cole, G.D., Mitchell, L.S., et al. Avoiding laparotomy in nonsurgical pneumoperitoneum. (1992) Am J Surg 164(2): 99-103. 5. Vischio, J., Matlyuk-Urman, Z., Lakshminarayanan, S. Benign spontaneous pneumoperitoneum in systemic sclerosis. (2010) J Clin Rheumatol 16(8): 379-381.